This person would really benefit from some practical help around the house including cooking some meals, light cleaning and tidying, mowing the lawn, making phone calls, helping on the internet and carrying things, plus the reassurance of having someone around their home overnight. 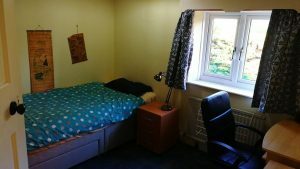 The accommodation on offeris a furnished single room, shared bathroom and use of the property’s garden and other facilities. There is parking available. There is a bus to Guildford (approx. 30-40 mins),or it is approx. 25 mins drive. There is parking available. The person enjoys watching TV (detective programmes, soaps, quizzes such as Countdown), reading the paper, playing Scrabble, doing crosswords, going to the theatre and going out for coffee or visiting garden centres. £100 + 20% VAT per month [Total £120 per month]. Plus possible contribution to Council Tax (£25 per month). NB Full-time students are exempt from Council Tax.